Rainbow hair has become beyond popular over the past few years, and it’s easy to see why! 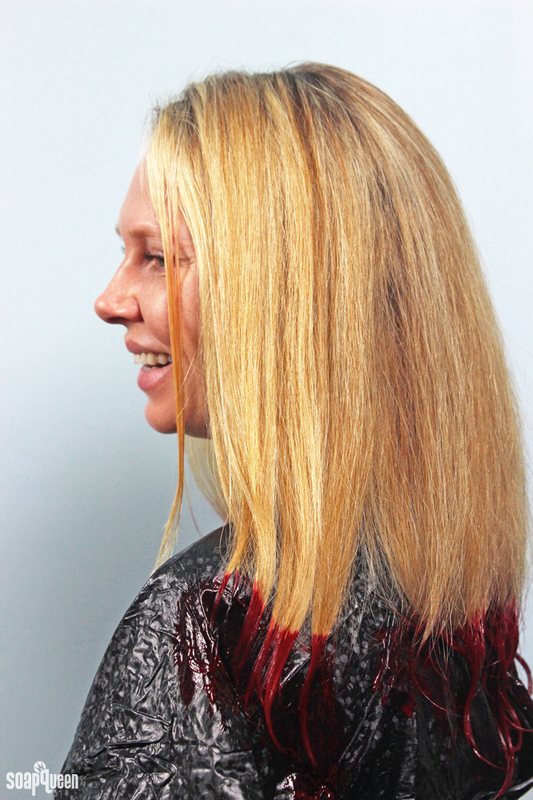 Adding color to your locks is a fun way to switch up your look. I love how versatile the trend is; there is a color and technique for every comfort level. Looking for a dramatic effect? Dye your whole head! Want just a hint of color? 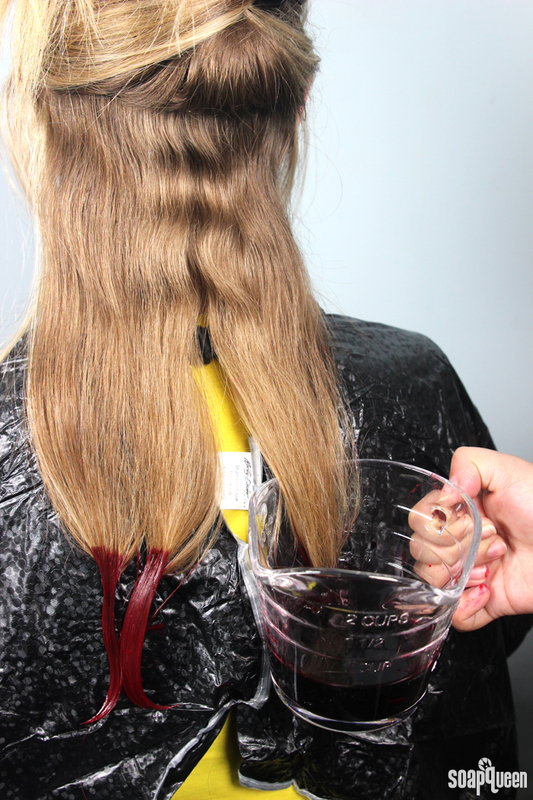 Dye the ends of your hair, or just a streak. After oohing and ahhing over rainbow-hued hair on Pinterest for months, I decided to take the plunge. But of course, I wondered how I could turn the trend into an easy and cost effective DIY project. The answer? LabColors! The idea of dyeing hair with LabColors came to me after watching a video on how to dye your hair with Kool-Aid. Since I had dyed my hair with Kool-Aid as a kid, I knew that concept worked. Both Kool-Aid and LabColors are made up of similar dye components, and I thought, “If you can use Kool-Aid to dye hair, why not use LabColors?” Then, it was time to experiment. In the photos shown above and below, I used Impatien Pink LabColor mixed with Stephenson Organic Hair Conditioner. Lightweight and full of hair loving ingredients, the conditioner is a great way to disperse the color and makes applying easy. As a bonus, you can save $10 off any Stephenson purchase of $20 or more with the coupon code: SAVETEN. But but don’t wait too long! Only the first 600 customers will get this deal. Browse through Stephenson products here. 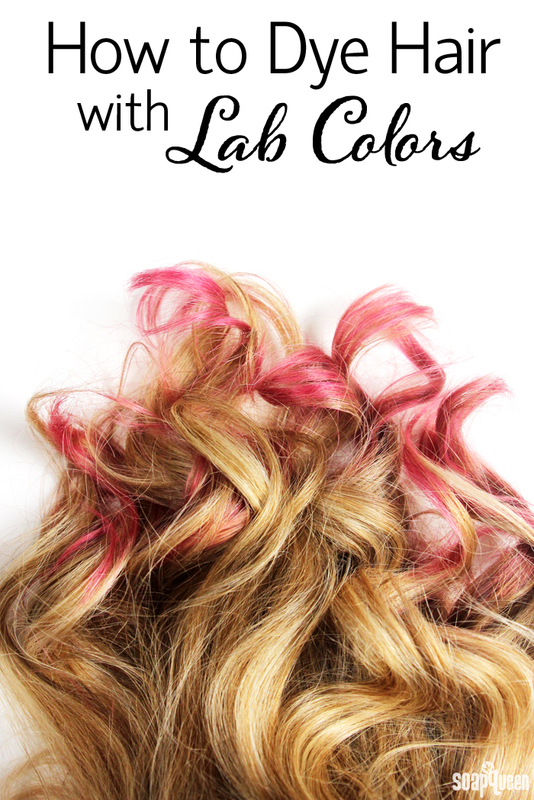 Interested in giving your hair a little color with LabColors? The process is easy as can be. 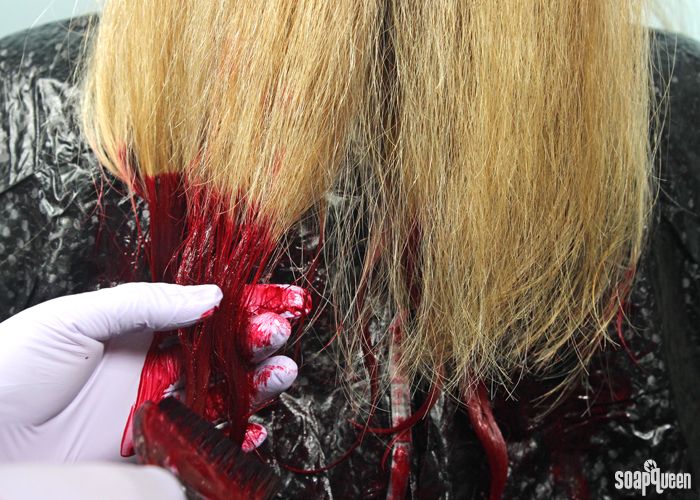 One word of caution: in our tests, we found the LabColor dye technique only works well on light colored hair. In addition, it works best on color treated hair. If your hair is brown, I recommend bleaching your hair first before applying the color. We found the LabColor does not leave much, if any, color on darker shades of hair. 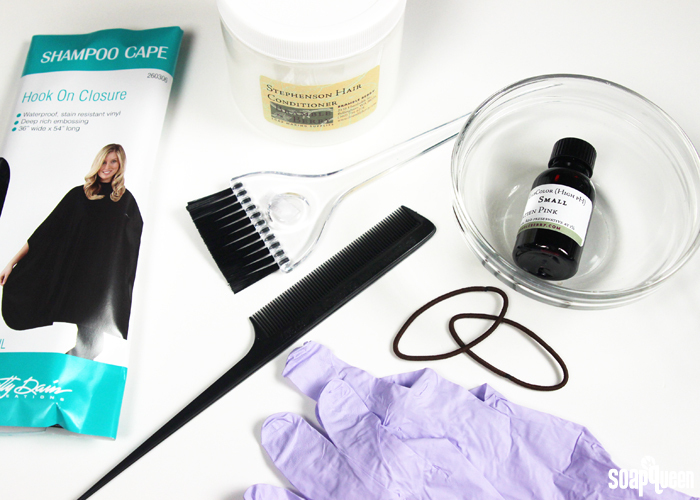 All you need to dye your hair with LabColors is undiluted LabColor and a diluting agent! I highly recommend diluting the color in Stephenson Organic Hair Conditioner; we found this the easiest way to apply the color. That being said, the color can also be diluted in hot water. Scroll down to see our results from dispersing the LabColor in both conditioner and hot water. In addition to your ingredients, I recommend picking up a few tools. A hair cape really came in handy to avoid the color from staining skin and clothing. You will also need a brush, some hair ties of clip to section your hair. Gloves are also a must…LabColors stain the skin quite easily! Cape on and hair is sectioned…I’m ready to color my hair! First, we did a little test to find out how the color is affected by diluting the LabColor in conditioner versus hot water. 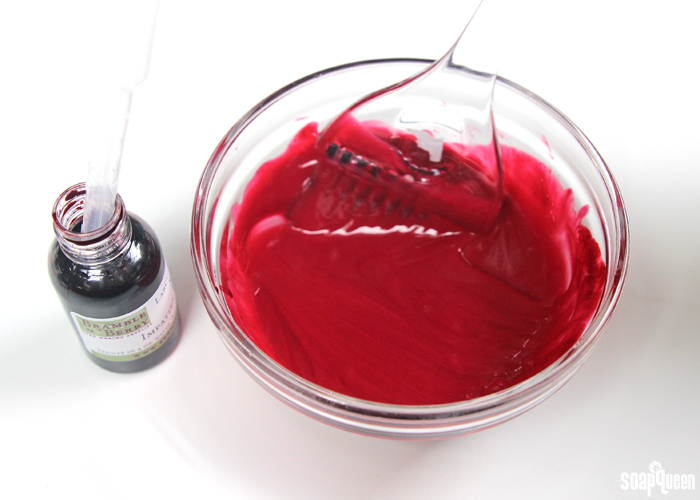 In one container, we added 18 mL of undiluted Impatient Pink LabColor into 3 oz. of the Stephenson Organic Conditioner Base (see photo below). 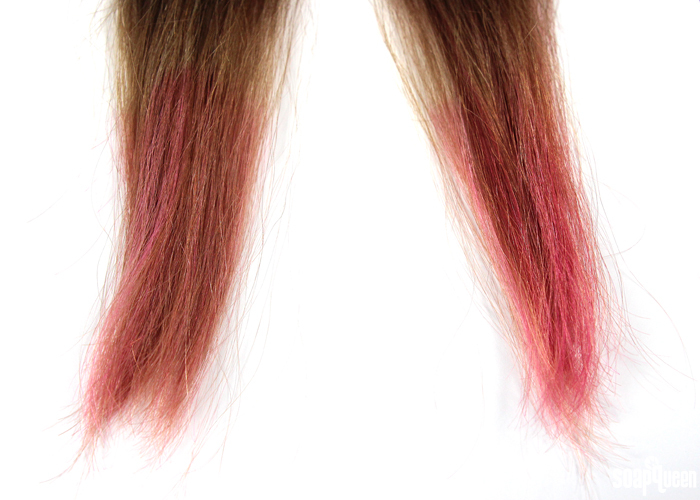 Then, we added 18 mL of undiluted Impatient Pink LabColor into 3 oz. of boiling distilled water. My hair was sectioned off into two small test pieces. The conditioner mixture was applied to one piece of hair, and the other piece was submerged in the hot water mixture for 10 minutes. After 10 minutes, we rinsed the hair in lukewarm water. If you want, you can dilute the LabColor in water or conditioner in different ratios, depending on how strong you want the color to be. If you have slightly darker hair, I would recommend using more LabColor in the dilution method of your choice (water or conditioner). For example, you may want to use closer to 30 mL of LabColor in 3 oz. of water or conditioner to achieve a more pigmented dye. Below are the dried pieces of colored hair. On the left is the hair dyed with the LabColor and conditioner mixture. On the right is the piece of hair dyed with hot water and LabColor. The difference between the two is very slight, but the hair dipped in hot water is slightly brighter and more vibrant. On the right is hair colored with LabColor and hot water, and on the left is hair dyed with LabColor and Stephenson Organic Hair Conditioner Base. While the hot water method results in slightly more vibrant color, it is a little bit more difficult to execute. The hair must be held in the water the entire time, and it’s harder to control how much hair comes in contact with the dye. Because the difference was so small, we chose to dye the rest of my hair with the conditioner method. The consistency of the conditioner made it really easy to paint on with a brush; we used one similar to this brush and it worked great! A friend applied the color mixture to the bottom inches of my hair. If you feel extremely confident in coloring your hair yourself, go for it! But, because the color is a little messy and will stain clothes and other porous surfaces, I would recommend having a friend apply the color to avoid a mess. I left the color on my hair for 20 minutes, then rinsed the color out with lukewarm water. I did not shampoo out the color. Instead, I rinsed and rinsed until the water ran clear. After rinsing out the color, I dried my hair with a blow dryer and styled it as usual. I’m so thrilled with how the color turned out! The color did fade quite a bit after the first wash, but was still a nice soft pink. After about two weeks, I was overdue for a trim and the pink tips got cut off. I loved the color for those two weeks though, I got so many nice compliments! 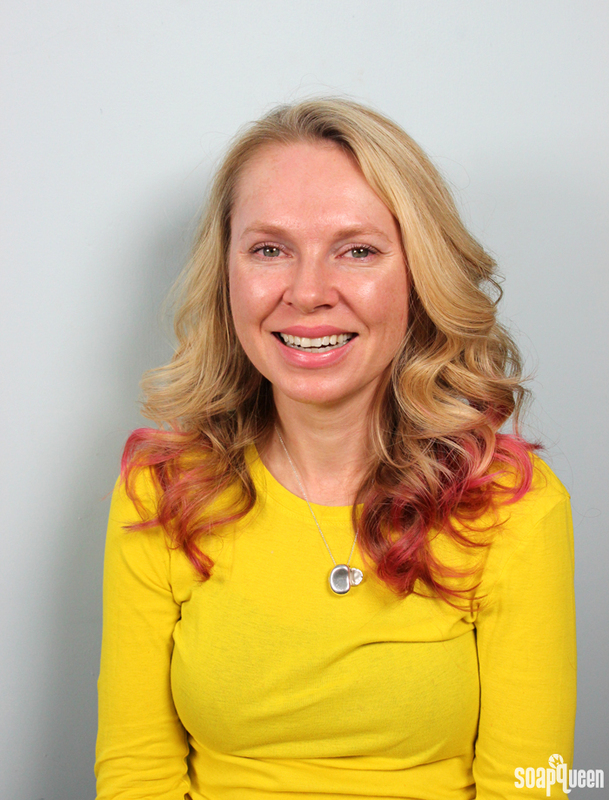 Once the office saw how well the LabColor worked on my hair, everybody wanted to try! 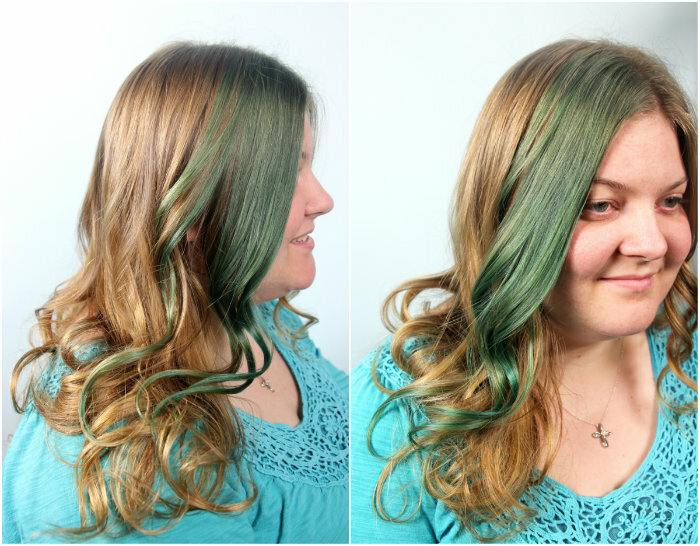 Below, Emily used the Aqua LabColor mixed in Conditioner Base to give the tips of her hair a light green, mermaid shade. I love how the green shade looks on her natural curls! 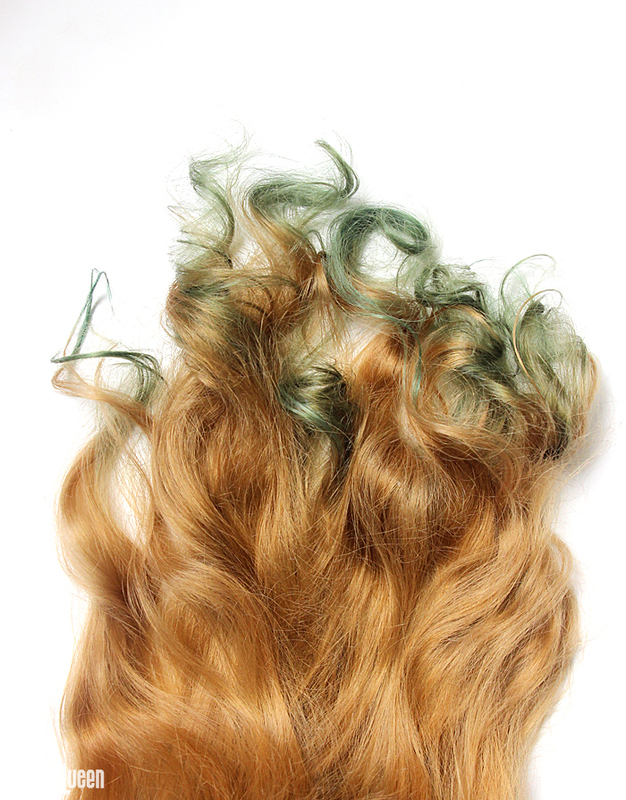 Emily used Aqua LabColor to dye the tips of her hair. The green looks gorgeous! Caitlin also got in the hair fun and used Brilliant Blue LabColor to dye the front section of her hair. Caitlin used the hot water method rather than dispersing the LabColor in conditioner. First, she boiled 1/2 cup of water and added 20 mL of undiluted Brilliant Blue LabColor. Then, she added 1 Tbs. of plain white vinegar and dunked her hair in the solution for about 20 minutes. Her thought was the vinegar would help the dye stick, much like when you use vinegar to dye Easter eggs. Her experiment worked, and the color ended up being nice and vibrant! 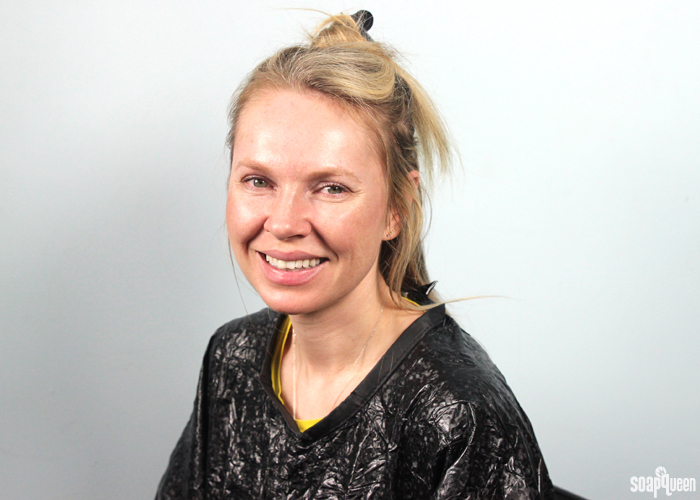 The photo below was taken a full two weeks after Caitlin applied the dye, which for her is approximately 7 washes. The added vinegar seemed to help make the color longer lasting. Now, here are a few trials that didn’t quite work. In our tests, we found that dark hair did not absorb the color. Also, lighter hair that has not been color treated did not absorb the color as well as bleached hair. Below, we mixed 30 mL Royal Purple LabColor in 3 oz. Stephenson Organic Conditioner Base, and applied the color to Cheyenne’s dark brown hair. After 30 minutes, the color was washed out in lukewarm water. As you can see in the bottom right photo, the color did not stick. We also tried the hot water dilution method with no luck. If you have extremely dark hair, I would recommend highlighting your hair first in order to get the color to stick. If you do not, the color may not show up at all. I would hate for you to waste for LabColor! Unfortunately, the LabColor dye method does not work on dark hair. 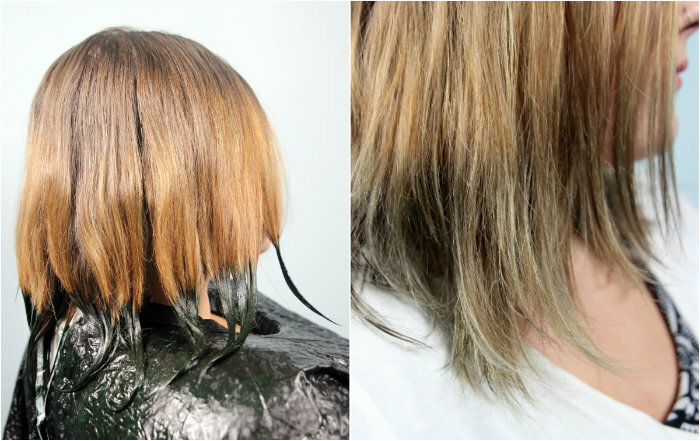 The technique works with light, color treated hair. 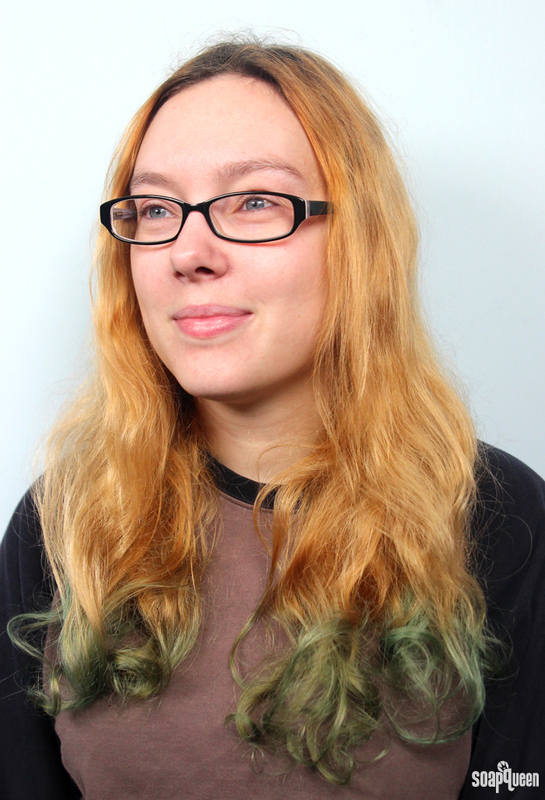 Rachel in customer service also tried dyeing her hair with LabColor and conditioner. 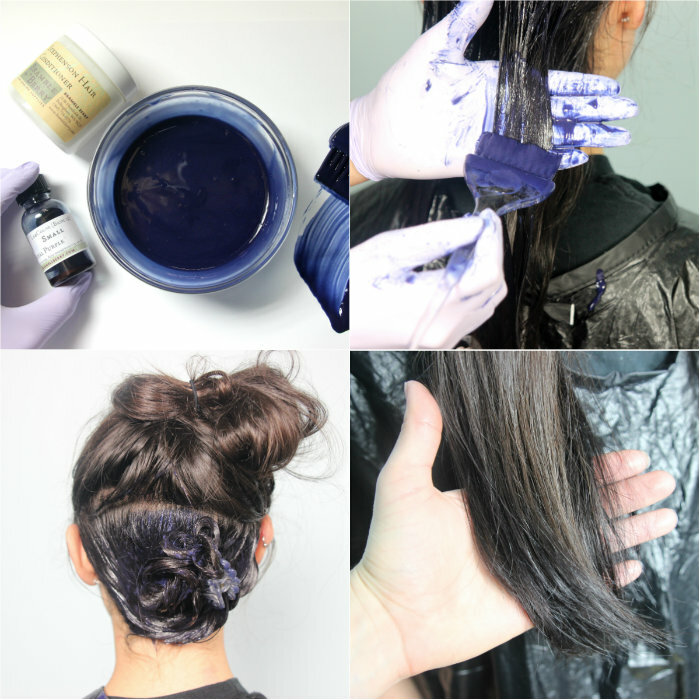 She used 30 mL Countryside Blue LabColor in 1 ounce of Stephenson Organic Conditioner Base and applied the dye to the bottom of her hair for 30 minutes. Despite having lighter brown hair, the color did not take very well. Shoot! After using the dye, I recommend washing your hair as little as possible to avoid the color from washing out. I found that after about 3-4 washes, the majority of my color has faded to a faint pink shade. Emily found that the majority of the green in her hair washed out after 1-2 washes, while Caitlin’s blue hair is still going strong! So the staying power of the color will depend on the person and the vinegar. My guess is the staying power will depend on your hair type, the shampoo and water temperature, and how long/concentrated the hair dye was. I wonder if I can use oxides on my hair to dye, what do you think? It could work? And also I wonder if you’ve tried lighter colors on a dark hair like yellow as it looks shiny or like lightened under the sun? I am interested in lab colors for coloring my hair which is a mixture of dark brown and black. What do you recommend and is there a tutorial for mixing colors to get a particular color for your hair? If you have dark hair, the LabColor dyes won’t stick. We tried it with several darker hair colors here without any luck! We found they only took on lighter, blonde hair. Sorry about that! Hey Kelsey thank you for all the wonderful videos. I am allergic to scents and am no longer able to find lotion, shampoo and conditioner. So I will be trying all your recipes. I love the idea of coloring as I no longer can use hair color. Wondered if your company has ever thought of recipes for hair colors? One tip for coloring hair: Products build up in hair and can prevent color from absorbing into the hair. To strip product from hair, wash with diluted baking soda. The baking soda strips products from the hair and raises the cuticle, leaving it ready to accept dies, perms, relaxers, and a whole host of other products. It will leave your hair feeling rough. After washing with the baking soda and applying the dye, rinse thoroughly with diluted apple cider vinegar to acidify the hair and close the cuticle. A good conditioner would also be a good idea if using the water bath method. You may find that even dark hair will absorb color this way – BUT – remember that dark hair can only go darker unless bleached first. I have colored my dark brown hair with a very dark red. I ended up with soft red highlights that I really enjoyed. 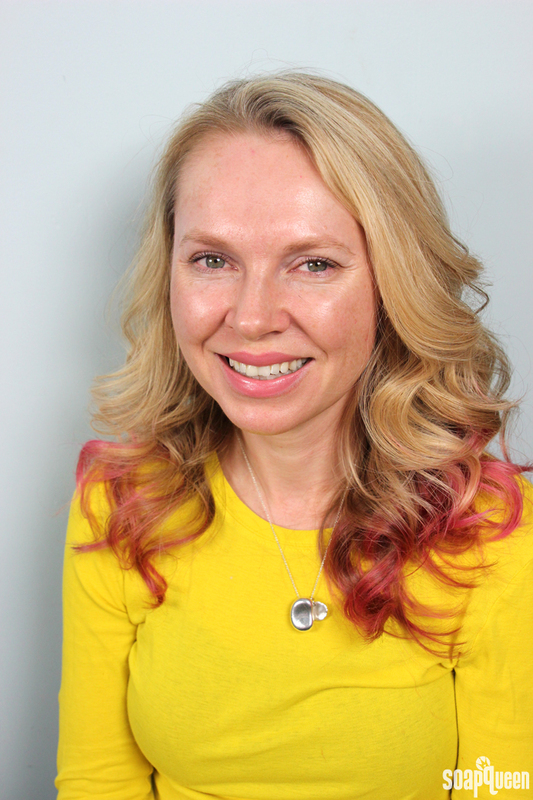 For very bright colors, even blonde hair should first be bleached. I have never used LabColors in CP soap. I’ve read something about diluting the LabColors first, is that necessary? can you point me in the direction of a post that explains this process in detail? THANKS !!! Thank you so much Kelsey ! : ) I look forward to trying my LabColors in CP soap !! This is very cool!! Wondering if you have ever come up with a way to make those cover up powders that people use on grey hair to buy a few more days between coloring their roots? Also, wondering how you would come up with a dark brown auburn color for that. We have a recipe for dry shampoo I think you may like. It has powders that help absorb excess oil, leaving your hair feeling nice and fresh. 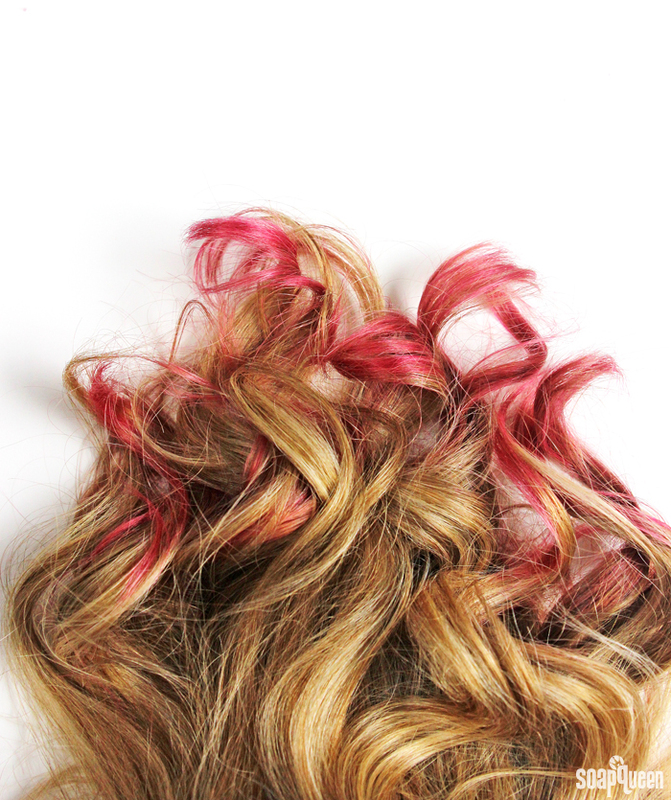 You can also add color to the mixture to help disguise your roots. 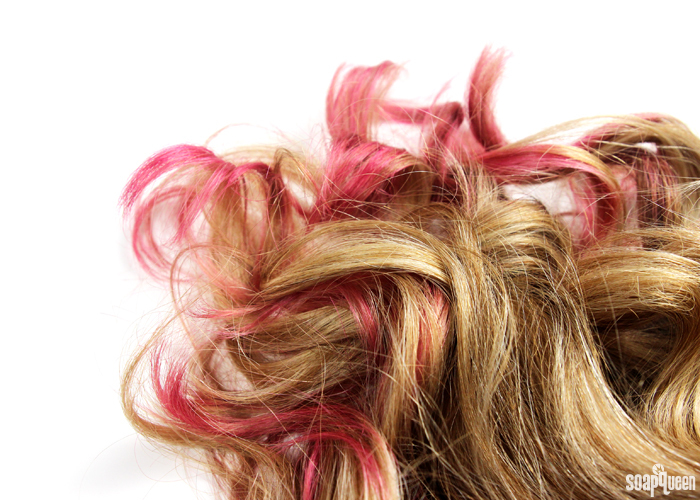 It may take a bit of experimenting with the color – we found it colored the scalp. Is this something that could be bottled and retailed?